We enjoyed authentic Indian breakfast at a beautiful place. Gayatri san was such a nice person and good at cooking, so we learnt a lot about Indian cuisine from her. We loved bothe her personality and dishes :) Hope to join her cooking class as well. Thank you, Gayatri san! I had good time at Gayatri san's. Every meal made with beautiful color combination and tasted well. She made everything from the beginning not only food but tea, when she prepared chai, she started from brending multi types of tea leaves, then add species, fresh milk and chopped fresh ginger. of course, tasted super delicious! She is very open minded person has variety of experience and accurate suggestion for the topic you talk to. It was a great experience to visit Gayatri and tasted her delicious Indian cuisine. to create a deep and different flavor. Watching her cook over 1 hour was like looking at a magic show. which I came to a conclusion that her brain is nicely organized like her kitchen shelves. she told me about her family, especially the mother who taught Gayatri the joy of cooking. At the end, she served a nice dessert and a cup of tea. Well this TEA was something very special, the best Indian style milk tea I've ever tasted!! I had been to India many times, and tried to cook Indian food myself, but always failed in taste. This was a great occasion to learn a great tip; how to use various spices. Wonderful to get to know Gayatri!! ガヤトリさんはおしゃべり好きで会話も楽しく、ほんの数時間の滞在でインドがぐっと身近になった気がします。他のメニューでリピートさせていただきたいぐらいです。Thank you for your hospitality, Gayatri! I had a great time tasting your excellent food and listening to stories about India! She is exactly professional about food and recipe. We learned not only Indian food culture but also the history, the difference between North and South and so on. Time went fast, we ate too much while talking. Although I was so full, I could feel my stomach still light. Because her meals are so healthy. I was really inspired her style! Would like to visit again soon!!!! Thanks Gayatri!!!! I was deeply impressed unexpectedly since her hospitality,kindness and interesting talking also a lot of tasty dishes make me sooooo happy!! I could talk with her husband ,too and I could hear their life in Tokyo,food culture etc.These chatting was very interesting and make me relaxed so much! Regarding her indian cooking is amazing..! I had seconds and thirds.More over,she made me many special indian tea ! And besides their home is like top level hotel,so I felt like I was in a rich indian hotel. . ! It was like a beautiful daydream. She nicely taught me about spice,tea,cooking tool and how to cook during cooking. Therefore I could learn a lot. I guarantee that if you visit her,you will have fabulous indian time with their warm heart. I will definitely join her cooking again.Thank you very much for the beautiful experience! ! I am Gayatri and I am a professional chef trained from one of the finest culinary schools in the world, The Culinary Institute of America. I have been a culinary enthusiast for as long as can I remember and followed my passion, cooking at home for a little over 15 years and cooking professionally for the past 2 years. I have worked at The Taj Boston, The Peninsula Tokyo and have done several stages in New York's best restaurants. 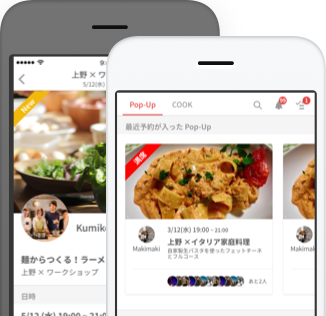 I have taught Indian cooking in Tokyo and Okinawa as well as at my school in the US. Before venturing into professional cooking, I published a food blog (www.theculinarynirvana.com) back in 2012-2013. Apart from my native speciality Indian, I have cooked French and Mediterranean food professionally. In addition to the time tested favourites across these cuisines I like to create my own recipes using fresh, natural and easily available ingredients for home cooking enthusiasts. Over the years I have got a lot of appreciation from friends & colleagues encouraging me to teach or cater/host food events. So here I am, taking the plunge!